The FGS 2014 Conference in San Antonio is approaching fast. 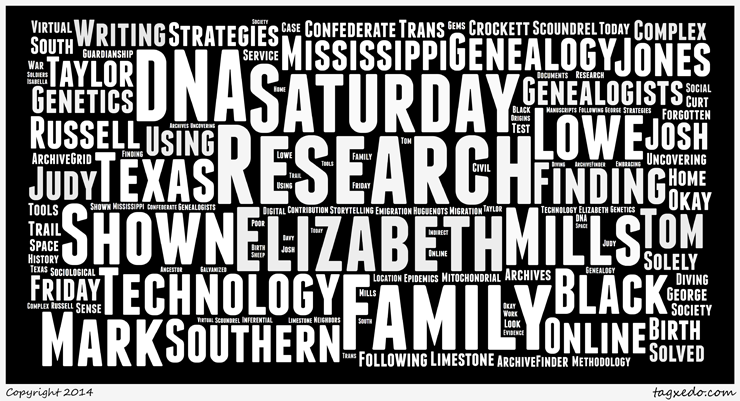 For those unfamiliar, this is the national genealogy conference put on by the Federation of Genealogical Societies. 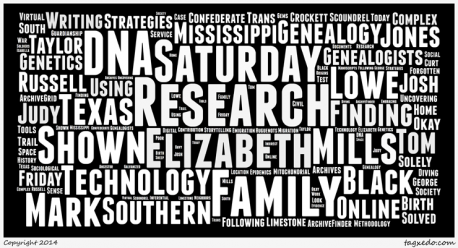 You don’t have to be a member of FGS or a member of any genealogical society to attend; it is open to anyone interested in genealogical research. 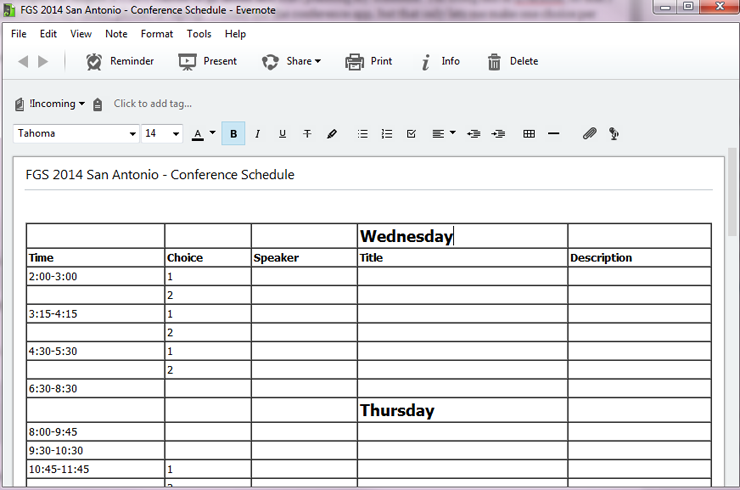 The conference begins on August 27, so I wanted to go ahead and start planning my schedule. 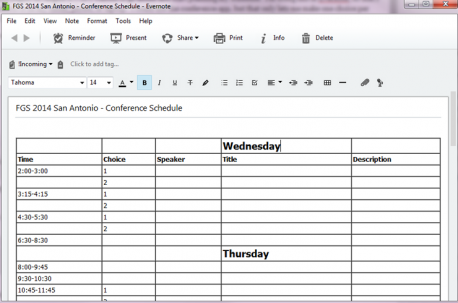 I’m doing this in Evernote, so that I will have access to it on my tablet, phone, or laptop. I could use the conference app, but that only lets me make one choice per time slot and I like to have a backup, in case I change my mind at the last minute. Next, I look at the list of program speakers to see which of my “must-see” speakers are presenting at this conference. For me, those speakers are Elizabeth Shown Mills, Tom Jones, Mark Lowe, Judy Russell, Josh Taylor, and Curt Witcher. I won’t necessarily attend every session they present, but I do want to make sure they get slotted in first. Looking at speakers, I found 11 sessions that I might want to attend. Elizabeth Shown Mills – Okay I “Got the Neighbors” – Now What Do I Do With Them? Tom Jones – Can a Complex Problem be Solved Solely Online? Next I look at the tracks offered for the conference. FGS 2014 has 26 tracks. The classes I most enjoy tend to fall into these categories: Methodology, Research Strategies, DNA, Southern Strategies, Writing/Publishing. Looking at the these tracks, I found four more classes. Lastly, I go through the schedule day-by-day and look at the options for any time slots I have remaining. So, that’s a first and second choice for most time slots. I’ll make final decisions about which sessions to attend when the syllabi are available. I always make a few last-minute changes and end up attending something that wasn’t even on my list. Plans are made to be changed. Great idea, Tonia! Like you, I rarely have only one choice per time slot, so I have a hard time using the conference app. This is a good alternative. Have fun at the conference! Wish I was able to go this year. Thanks, Jenny. I need to add another column to the table, so that I can the room, once I get to San Antonio. That way I’ll only have to look at one thing for my schedule.